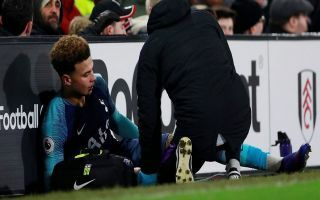 Tottenham have an injury crisis on their hands after Dele Alli limped off with a hamstring injury after scoring in Tottenham’s win over Fulham today. Alli scored a powerful header in the 51st minute of the clash, check it out here. The England international felt some pain in his hamstring later in the second half when he was chasing for the ball near the touchline. The star found it difficult to stand back up on the pitchside and was subsequently brought off for Georges-Kevin Nkoudou. Tottenham are now without Alii, Harry Kane and Heung-Min Son. Kane was ruled out until March earlier this week with an ankle injury, according to Sky Sports. Tottenham will be down to barebones for the second leg of their Carabao Cup semi-final clash against Chelsea on Thursday evening. With Spurs just one game away from winning a place in the final it would be heartbreaking for the side to crash out of the competition, especially given that they are heading in with a one-goal lead.